, look to a great future building a team by recruiting and giving game practice to young players . Six teams had a rest last weekend . By round 12 , the Finals are virtually decided .Some teams are resigned to life without Finals for Season 2013 . The Tigers continue to win , debunking critics , and ensuring they avoid the dreaded 9 th spot finish , on the League ladder . Essendon win , with a Joe and a Jobe , both sons of prominent ex Bombers . Hawthorn are sitting pretty , the SA's Port Power , and WA's Freo are winning . Collingwood are quietly achieving , keeping their heads down after Eddie's , infamous indigenous Faux Paus . AFL Fans , wearing their football jumpers , jerseys , guernseys , are thrilled , spilled and getting their fill , watching the games , and behind the scenes action . Its only footy , but we like it ! 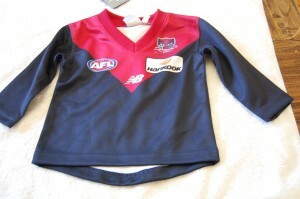 This entry was posted on Tuesday, June 18th, 2013 at 9:46 am	and is filed under AFL, football jumpers. You can follow any responses to this entry through the RSS 2.0 feed. Both comments and pings are currently closed.